Home | Blogs | What’s a bottle without a title? What’s a bottle without a title? Mike Horsten, General Manager Marketing of Mimaki Europe, wrote a guest article for the Drupa Blog. The world of cosmetics is the place to show off, often with fancy printed bottles and glass containers whose value is higher than the contents inside. Yes, the container has been more important to this industry than any other. With a good-looking bottle, you can sell more; with a good fragrance in an ugly bottle, the sales are likely to be low and unprofitable. This presents a great opportunity for digital print. Today, the cosmetics industry is facing the challenge of what I call the “Personal Luxury feeling.” The ability to buy your own personalised cosmetics or perfume containers will be a big trend in the not-too-distant future. Just imagine a standard bottle with the print different for each customer! It is a new sales and marketing strategy that will change the cosmetics industry. It would drive profits up, since many consumers would pay extra for this service. But there are some problems, of course, or perhaps it would already be a widespread practice. Glass printing is not easy; the print needs to be able to withstand alcohol and rubbing tests, the print needs to be human safe, and it needs to be very clear and sharp. The reason for the clarity and sharpness is the large amount of fine text that is needed on a cosmetics product, including the ingredients, shelf life and the barcode for the product; they all need to be sharp and straight. Printing on a flat surface is easy; but most bottles are round, so there needs to be a simple way to print on round objects. Some products are in big containers and some are in small round ones, like mascara or liquid foundation. So there are some hurdles to overcome. In addition, many of the caps for these products are made of plastic, which presents yet another challenge. Traditionally, printing on glass was done via tampon/pad silkscreen printing. This process requires a new print for each colour, which is why you see so many cosmetics products with only one colour print, mostly white. Using more colours is difficult due to the fact that you need to line up the different colours and you would have to use halftone screens to get the job done. I’m not even speaking of the registration problems one would face between colours. On a round object, this would be a real nightmare. Then you need to know that the current generation of primer and/or inks that are used have been specially made for glass printing, specifically for good adhesion to the glass object. Another problem is that the glass is moved through the filling machines after it has been printed, so there is always a risk that the print will be scratched or damaged, making the container unsellable. To address this risk, most printers put a large amount of ink on the container to make sure it stays on. This can be seen on most cosmetics products on the shelf today. With a digital printing system, we can eliminate most of these problems. First, we can print in 16.8 million colours in contone mode, giving us nice photographic quality. 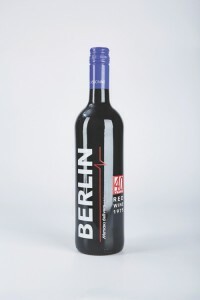 We can add a varnish layer for protection of the print, and we can make each bottle personal. We can print them on demand, so no big production runs would be needed, saving huge amounts in inventory costs and improving cash flow. 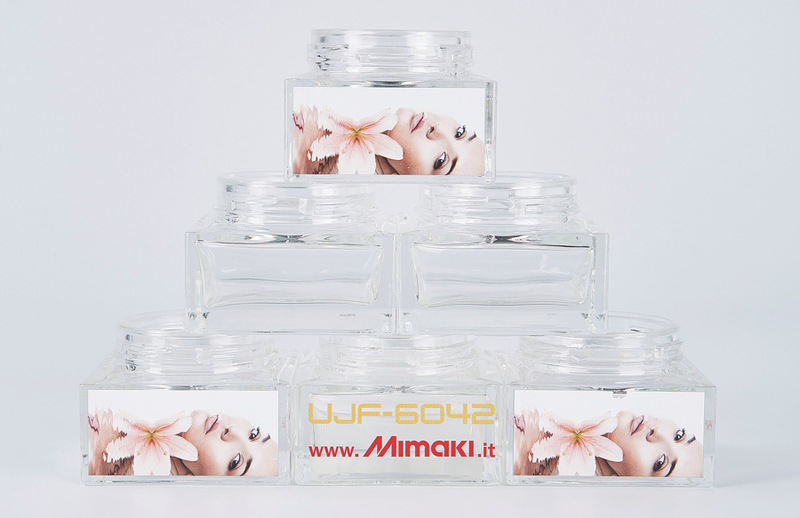 For printing on flat surface bottles and containers, this is already being done today, used by many of the larger brands for their specials and personalised holiday gifts, using products like our UJF Series printers. We have printed cosmetics boxes and containers around the holiday times in places like department stores such as Harrods in London, and in many airports around the world. Live printing, just wait 10 minutes and your personal product is ready. But this has always been a promo print, a “now or never” type of deal, and it certainly is not a common practice today. Although it has been very successful, it does not solve the production problems for small batches that need to be printed around the world. Did you know that there are more than 50 standards for the labelling of cosmetics products in the world? The languages, the legislation and the fine print are different from jurisdiction to jurisdiction. Customising the packaging translates to unsustainable costs for high-street brands whose expensive perfumes and cosmetics might be produced in low volumes with diverse content. 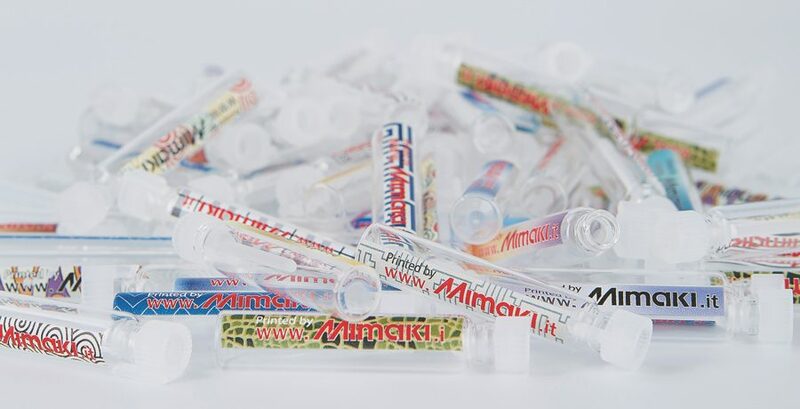 We have been working on a solution for these problems together with the primary players using the new generation of UV-LED curing flatbed Mimaki printers. We have developed new inks and printable primers that can be used to print on glass. Although there are always some extra requirements needed for printing directly on glass, we have solutions like external primers that help minimize those challenges. The biggest challenge, though, was printing on round objects. This has never been easy, but with the addition of our optional Kebab solution, we are now able to print on round objects with a diameter ranging from 1 cm to 11 cm. This means you can print just about all types of bottles and containers with one printer. The examples are numerous and the applications endless. The funny thing is that you can even print customized content on the boxes containing your special product. Our UJF7151 Plus was made for an industrial market that demands high-speed production and quality all at the same time.